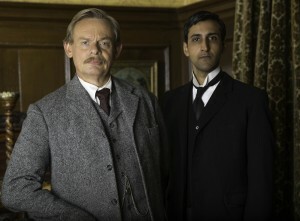 Martin Clunes (Doc Martin, Men Behaving Badly) stars as the celebrated novelist and physician Sir Arthur Conan Doyle in ITV’s three part adaptation of Julian Barnes’ acclaimed novel, Arthur & George. Written by Ed Whitmore, the drama is based on true events in Conan Doyle’s life who famously wrote the Sherlock Holmes detective novels. 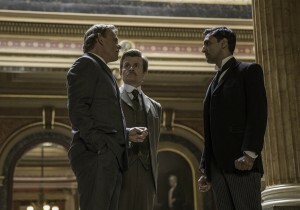 Set in 1906 in Staffordshire, Hampshire and London, the drama follows Sir Arthur and his trusted secretary, Alfred ‘Woodie’ Wood (Charles Edwards) as they investigate the strange case of George Edalji (Arsher Ali), a young Anglo-Indian solicitor, imprisoned for allegedly mutilating animals and writing obscene letters. Arthur & George explores what we think we know about Sir Arthur Conan Doyle’s life and is a truly fascinating insight into one of the most famous and well known British writers today. The cast and crew filmed for one day at The Historic Dockyard Chatham where they recreated several day and night street scenes. The Historic Dockyard Chatham lies on the River Medway and boasts a variety of Georgian and Victorian architecture, maritime environment, dry dock, cobbled streets, and industrial buildings. The Historic Dockyard Chatham is a popular film location which has previously featured in productions such as Mr Turner (2014), Call The Midwife (2012-2015) and Children of Men (2006). Arthur & George starts on ITV1 on Monday 2nd March 2015 at 9pm. This entry was posted in Filmed in Kent and tagged Arthur & George film locations, Charles Edwards, Martin Clunes, Sir Arthur Conan Doyle, The Historic Dockyard Chatham, TV Drama. Bookmark the permalink.